Many watchmakers in recent years have touted the advantages of watches fit with silicon hairsprings, citing improved shock resistance, greater precision and complete anti-magnetism, among others. 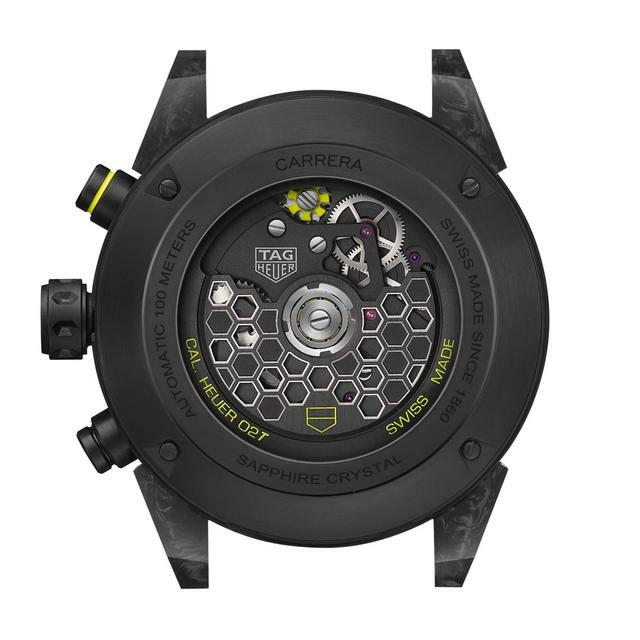 Now, TAG Heuer takes that chorus to the next level with a wholly new hairspring material: carbon composite. 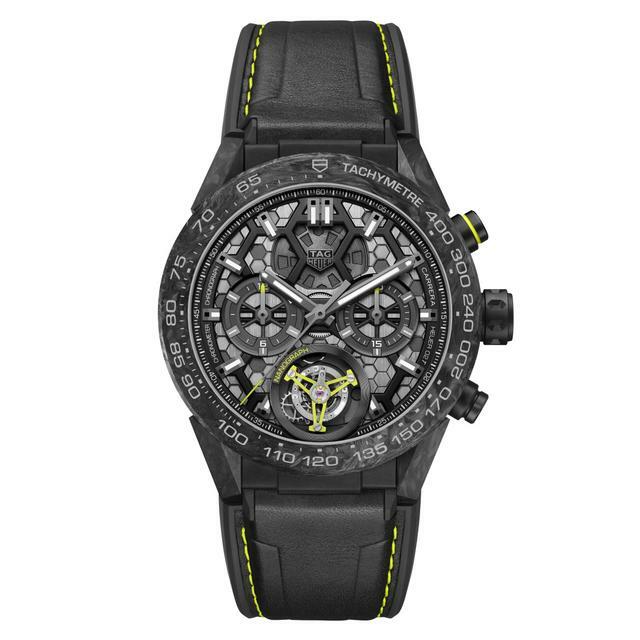 The watchmaker’s new Carrera Calibre Heuer 02T Tourbillon Nanograph, introduced in Geneva earlier this month, is regulated using a carbon-composite hairspring within its tourbillon. Produced by TAG Heuer from a gas, the low-density carbon-composite hairspring offers advantages when compared to more traditional Elinvar or newer generation silicon hairsprings, according to the brand. Primarily, the carbon-composite hairspring is virtually unaffected by gravity and shock. 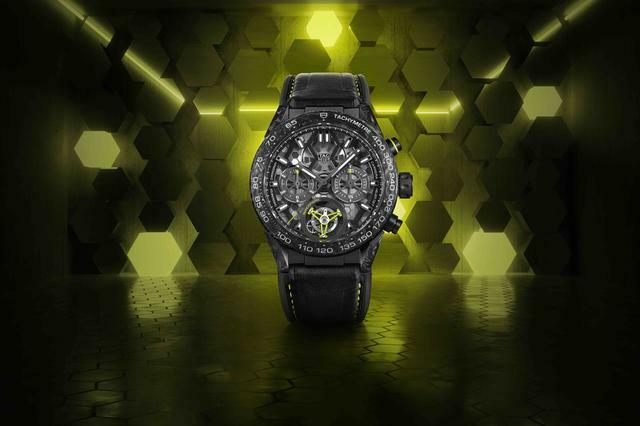 TAG Heuer says it has tested the hairspring in watches that suffered a simulated 5,000-gram/1m fall onto a hard surface. Where metal hairsprings bent and silicon hairsprings broke, the carbon-composite hairspring remained completely intact. TAG Heuer touts additional advantages, including perfect concentric oscillations (which improve precision) and pure anti-magnetism. In addition, the carbon-composite hairspring is produced with the collet already attached. Usually, this small part, which attaches the metallic hairspring to the balance wheel axis, requires additional assembly that, when not done properly, can negatively affect accuracy. By pairing the hairspring to an aluminum alloy balance wheel, TAG Heuer adds that it has also reduced the hairspring’s negative reaction to both heat and friction. 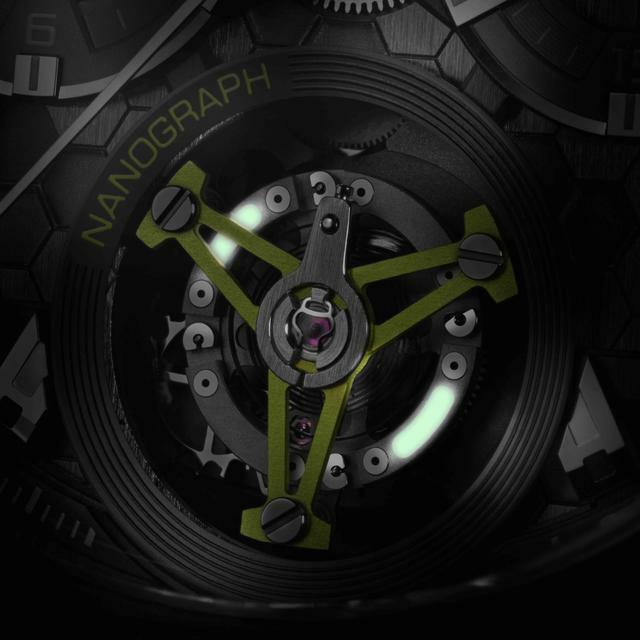 Given all the technical advantages nanotechnology can seemingly offer to movement precision and longevity, we suspect TAG Heuer has already devised plans to utilize its technology inside non-tourbillon calibers in coming years. 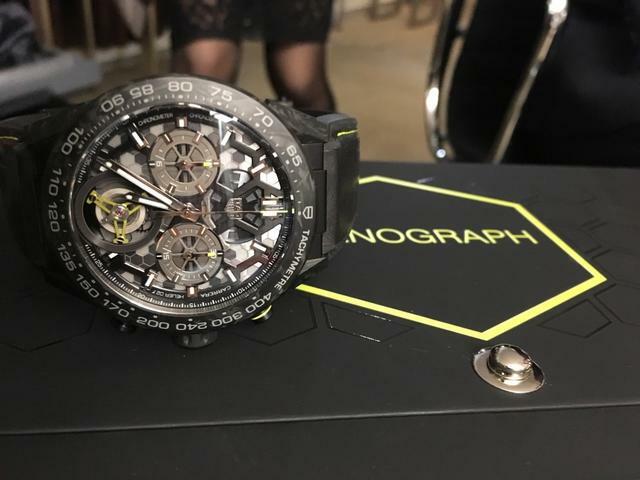 While TAG Heuer retained much of the darkened skeleton dial seen on many versions of its already ground-breaking 02T Tourbillon collection when designing this latest version, the brand has also taken full advantage of the aesthetic possibilities offered by nanotechnology. Since the new hairspring’s carbon-composite material creates a miniature hexagonal pattern, TAG Heuer has chosen to mirror that design in the dial of the Carrera Calibre Heuer 02T Tourbillon Nanograph. The watchmaker has devised a multi-layer dial and movement combination that features sandblasted and tiny hexagons on the movement plate, many of which are visible through an open-worked dial. 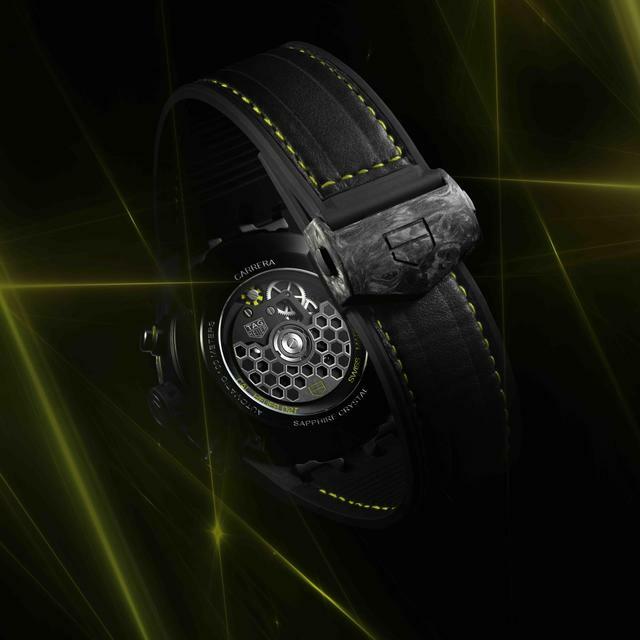 The same pattern can also be seen on the rotor, which has been treated with black PVD and is visible through the sapphire caseback. 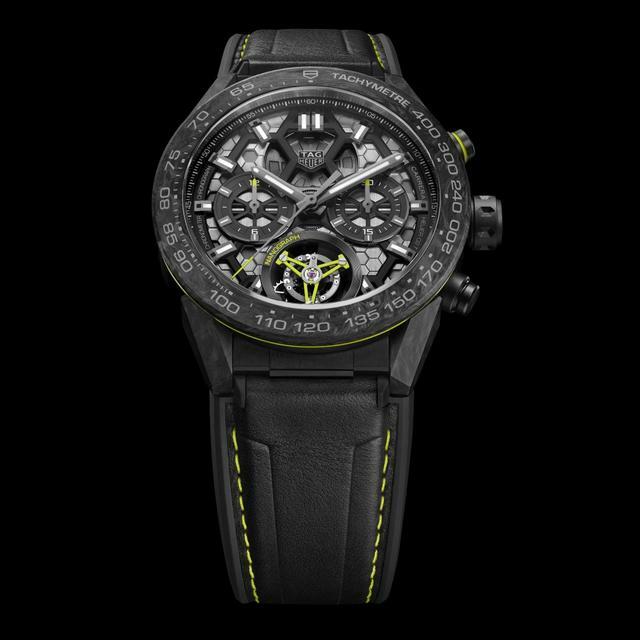 But most visibly, the tourbillon’s bright neon-green bridge and smartly placed accents (around the case, on the chronograph pusher, column wheel, chronograph hand tips and strap stitching) set the watch apart aesthetically from its forebears while retaining its Carrera profile. Touches of SuperLuminova just under the bridge ensure that the tourbillon, complete with embedded nanotechnology, remains visible in darkness. 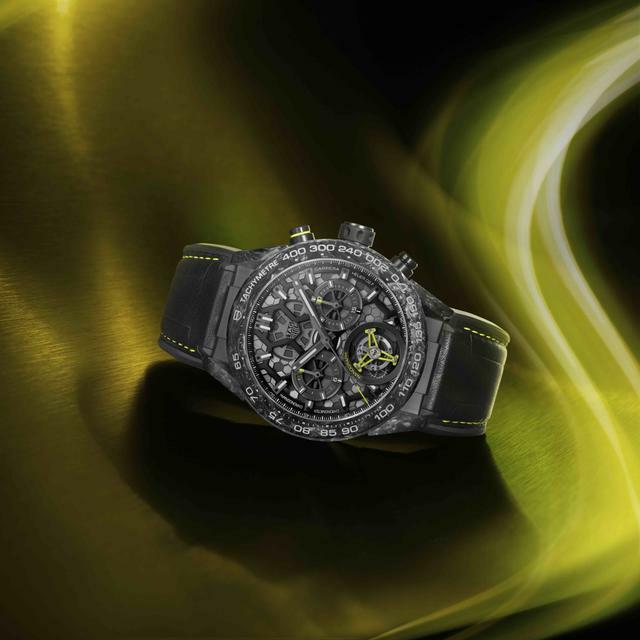 Thankfully, TAG Heuer has added the technical advantages of nanotechnology to its well-priced 02T Tourbillon collection with only a modest premium. 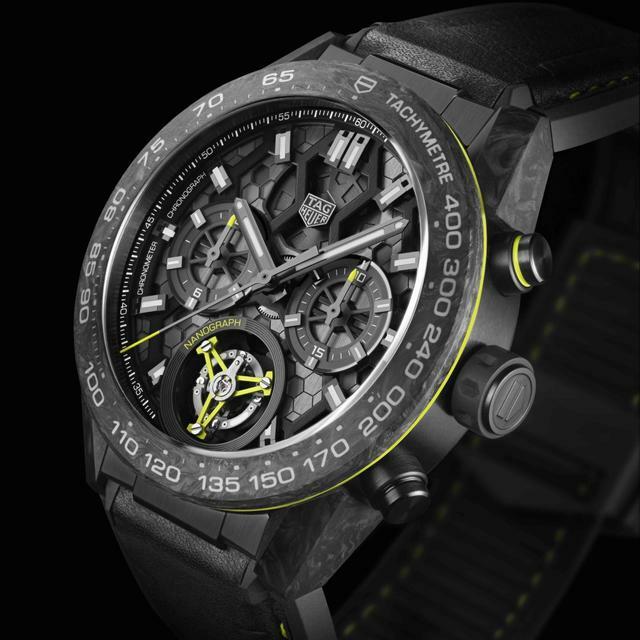 The new Carrera Calibre Heuer 02T Tourbillon Nanograph is set to be available this spring, priced at $25,500. Strap: Black calfskin leather and rubber, carbon buckle with black PVD titanium folding clasp. Watch arrives with watch winder.